When the world’s forests are shrinking, It seems India has not only been able to turn the tide but also did so in a commendable way. India has been keeping a track of its forest cover since 1987. The report is aimed at “How much and where our forest cover is, irrespective of its origin, species, ownership, land use or legal status”. The India State of Forest Report is published by The Ministry of Environment, Forest and Climate Change (MoEFCC). If one scours through the 36-page report, one would find India has done tremendously well in preserving and expanding its forest cover while forest cover around the world has been on the decline. India’s green cover now stands at 24.39%. India with this has achieved a rank of 10th in the world with regards to percentage of area under green cover. India is ranked 8th in the world for annual net gain in the forest area. 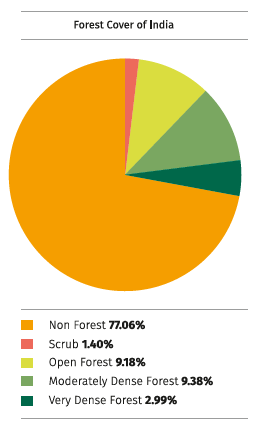 Percentage of forest cover illustrated in a pie chart. 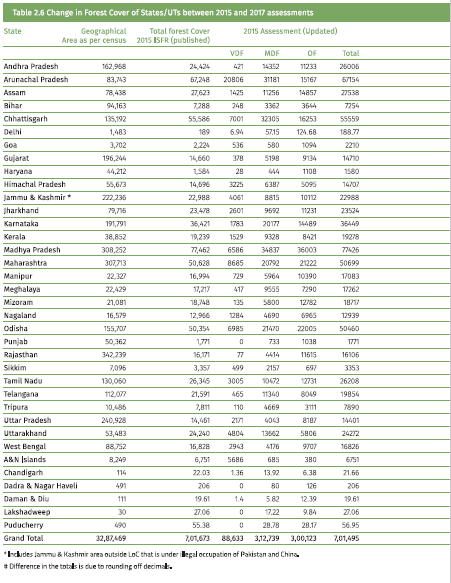 India’s total forest cover as per report is around 7,08,273 sq km. which is roughly 21.04% of India’s geographical area. 98,158 sq km or 2.99% of forest cover is attributed to VDF (Very Dense Forest – Tree Canopy density more than 70%). MDF (Moderately Dense Forest – Tree Canopy density is more than 40% but less than 70%) cover is around 3,08,318 Sq Km or 9.38% of the forest cover. Whereas 9.18% or 3,01,797 Sq Km of the forest cover is attributed to OF (Open Forest – Tree Canopy density 10% or more but less than 40%). The report goes in depth and breaks down the numbers by Union Territories (UT) and states. 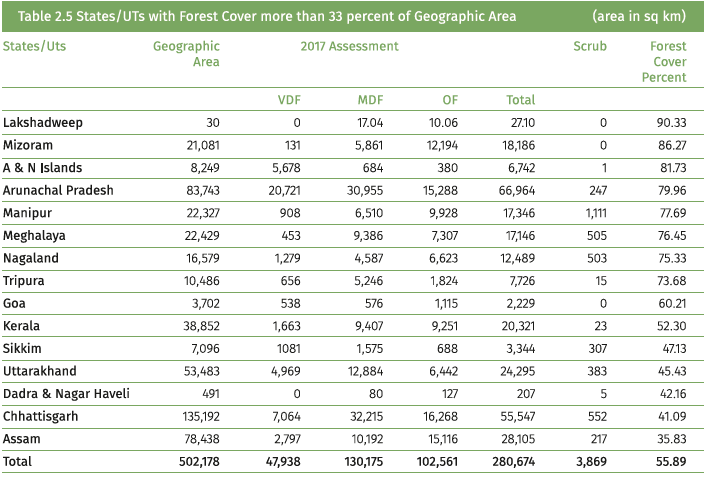 According to the report, fifteen states and UTs have a forest cover of more than 33%. Seven out of these fifteen have a forest cover of more than 75% whereas the other eight have a total forest cover area between 33% – 75%. 15 states with the highest forest cover (as per percentage of their land mass). Lakshadweep, Mizoram, Andaman and Nicobar Islands, Arunachal Pradesh, Manipur, Meghalaya, Nagaland, all have forest covers over 75%. The report indicates an increase in the national forest cover. 6,778 Sq Km of forest cover has been added to the forest cover area of India. Andhra Pradesh, Karnataka, and Kerala are the three highest contributors to this growth. Andhra Pradesh increased its forest cover by 2,141 Sq Km. Karnataka increased its forest cover by 1,101 sq km. Kerala increased its forest cover by 1,043 sq km. If we are to look into the national aspect of it all, there has been an increase of 9,526 Sq Km of VDF (Very Dense Forest), which absorbs the most amount of carbon dioxide. There has also been an increase of 1,674 Sq Km in the OF (Open Forest). However, there has been a significant decrease in MDF (Moderately Dense Forest), the decrease is estimated at 4,421 sq km. A cause of concern is the report’s indication of decreased forest cover in the greenwash’ areas in the North-East part of the country. The report cites development pressures as the reason for the decrease. Green Wash areas are areas marked as Green by Survey of India’s topographical sheets. Interestingly, India also reiterated its diplomatic stance on Jammu & Kashmir in this report. While curating this report, India counted the forest areas outside the LoC in the Jammu and Kashmir region and added them to the national database treating those areas as Indian territory. The document states that those areas are under ‘illegal occupation of Pakistan and China’.